Waiting on Wednesday is a weekly meme hosted by Breaking the Spine. Each week allows you to spotlight an up and coming release you are looking forward to. 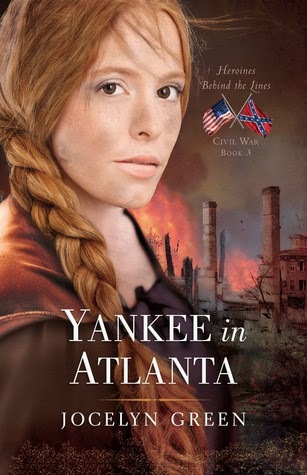 When soldier Caitlin McKae wakes up in Atlanta wounded in battle, the Georgian doctor treating her believes her only secret is that Caitlin had been fighting for the Confederacy disguised as a man. In order to avoid arrest or worse, Caitlin hides her true identity as a Union loyalist and makes a new life for herself in Atlanta. Trained as a teacher, she accepts a job as a governess for Noah Becker, a German immigrant lawyer, who is about to enlist with the Rebel army-when the Federal army threatens his homeland, he feels he must defend Georgia to protect his daughter. Once he leaves, Caitlin is in charge of seven-year-old Analiese. Thieves steal much of her food supply, and Noah isn't paid for months. Soaring inflation makes most things unaffordable, and Caitlin and her charge fight starvation. Then in the spring of 1864, Sherman's troops edge closer to Atlanta. Caitlin tries to escape north with the girl, but is arrested on charges of being a spy. Will honor dictate that Caitlin follow the rules, or love demand that she break them? The historical detail that Jocelyn Green applies to her stories is fantastic! She is able to transport the reader back in time. From the Civil War you generally hear about the men who fought, but women played an important roll as well, and these books are a wonderful tribute. Sounds like an exciting book! I'm waiting on Full Steam Ahead by Karen Witemeyer. She's one of my favorites, and this one has a different setting than I'm used to- the steamship industry. She always manages to make the romance wonderful in the midst of adventure. Sounds like a great historical read! Thanks for sharing! Heidi, I'm waiting for that one too! I love Katen Witemeyer's stories. They are so fun! The cover for FSA looks like it will be another fantastic one!